Home / Blog » Do You Have an App for That? There are over 3 million apps available as of May 2015, the vast majority available through the Apple app store and Google Play, and about 7% of them are medical/health related. Whether it’s tracking exercise, weight loss or monitoring diet, managing your health on your smartphone is becoming more and more popular. 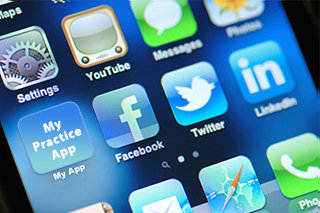 You may be thinking that you don’t need an app for your practice. But did you know that 35% of healthcare providers offer mobile apps for their patients? Apps that connect doctors with their patients and provide valuable mobile resources have the potential to be a game changer! The healthcare industry has the power to use mobile apps to interact with patients in many ways. In today’s digital world, hospitals can deliver patient engagement apps and mobile treatment tools for a variety of content – from general wellness to pregnancy to physical therapy to cancer care. Think about it, the possibilities are endless. Digital health apps can benefit your patients by being convenient, efficient and educational. These apps can engage patients with their health by scheduling appointments, helping monitor medications, and helping patients follow their treatment plan accurately. You have the ability to empower patients with mobile apps as tools to take control of their health. A practice or hospital app is a great way for patients to connect with you easily and efficiently right from their phone, so your practice will always be right at their fingertips. Your Practice Online can build a mobile app specific to your healthcare business needs.